When the phone rang and the gentleman on the other end said he wanted to place an 11 year old GSD, I winced. He had sold his house, was moving to a temporary apartment and would soon be leaving the country. I agreed to see and evaluate the dog with a note of realistic caution to the owner...he'd better start thinking about a contingency plan. Greta sure was a nice ole gal...we got her right up on our web site. We did get a couple of inquiries but no one wanted to deal with the little annoyances that come with aging. Rescue organizations function within a large, cooperative network. I received an email from Suzanne Jacoby of Red Mountain Senior Dog Rescue. She said that she had an elderly woman looking for an older, large German Shepherd. 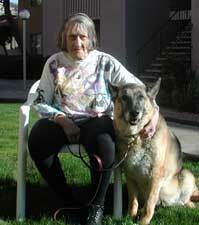 I referred her to the two senior canine citizens currently in our program that she could view on our web site. About a week later she emailed again with the Pearl's phone number and advised that, although the woman was 86 years old, she felt that it would be worthwhile to pursue. I immediately phoned Pearl and told her all about Greta. I explained that she was on medication and Pearl laughed and said they could take their pills together. I made it clear that the average life span of a German Shepherd is between 10 and 12 years and that many reach between 13 and 15 years as well. I asked about her mobility and ability to care for such a dog. Pearl was undaunted and reminded me that, in her younger days, she ran a Great Dane Rescue. Further, she was still driving her car and able to make a trip to the vet, if need be. I also explained our policies and advised that I would be paying her a home visit. Now we don't usually place German Shepherds in apartments for a number of reasons. In this case, however, it seemed appropriate. Greta didn't need a lot of exercise, she needed a lot of TLC, a sense of security and a devoted companion who was around all of the time. And Pearl's needs were exactly the same. After meeting Pearl and her husband Bert, and checking out what would be Greta's new home, I agreed to introduce them. We arranged to meet at a nearby park. The meeting went so well that Greta went home with them on the spot. Every time I made a follow up call, I held my breath. And each time, Pearl told me everything was going great. I asked that she periodically contact me with updates. Whenever I heard Pearl's voice on the other end of the phone, I found myself waiting for the other shoe to drop. The 1st time she informed me that she had made arrangements for Greta to live with her granddaughter, on her 40 acre ranch, should anything happen to Pearl. The 2nd call was simply to let me know that Greta had a bath and went to the vet for a check up...she had her tested for every disease known to man or beast, and apart from a sluggish thyroid, Greta was in fine shape. In subsequent conversations Pearl related that Greta shadowed her everywhere. She spoke about how Greta would place her body across Pearl's if she sensed any unsteadiness. The 4th call was to tell me, "if I were to have molded a dog from clay and give it life...it would be Greta... I cannot imagine life without her." I assured Pearl that I was certain Greta felt the same. We were into week five of Pearl and Greta's union when I got a call from a very distraught Pearl. The management of her apartment complex had informed her that, despite the fact that she was permitted to have pets weighing up to 100lbs (which we had verified), certain specific breeds were excluded; Rotties, German Shepherds, Dobermans, Chows, and Pit Bulls. There was no mention of this restriction in her lease nor was she ever previously made aware of this policy. Nevertheless, Greta would have to go. I assured Pearl that we would fight all the way to court if need be. She informed me that she would rather live in her car than part with her new companion, yet I could sense the panic associated with the possibility of being uprooted at nearly 87 years of age and an ailing husband to boot. I advised Pearl that I would need a few days to do some research. I had to read the Landlord/Tenant Act and familiarize myself with that aspect of the law. In the meantime, I suggested that she get a letter from her doctor stating that Pearl needed Greta for her psychological and physical well being, that Greta assisted both she and her husband with balance issues and that Greta provided them with a sense of security as well. Bert was becoming totally blind as a result of his diabetes and spent a good deal of time sleeping, leaving Pearl lonely and depressed. That is, until Greta came along. Both she and Greta became reignited. This was truly a symbiotic relationship. I tracked down a member of our regional German Shepherd club who had moved to California. She was an attorney and a GSD aficionado. I knew that she probably wasn't conversant with Arizona Tenant law but thought perhaps she could give me some guidance by playing devil's advocate. Before contacting her, however, I put in a call to the co-founder of "REACH" (Restoring and Extending Ability with Canine Helpers). I asked if she thought getting an 11 year GSD certified as a SERVICE DOG was feasible. I related Pearl & Greta's story and also told her about the doctor's letter I had requested. In essence, she said that as long as the dog could fulfill Pearl's needs as outlined by the doctor, and provided Greta could pass the Level One Assistance dog test, "Yes...assuming you feel that Greta's temperament is sound enough." I asked her to start the process and told her I'd get back to her. Then I phoned the attorney in California. She pointed out a few issues to consider and suggested that, rather than a long, protracted legal battle, she would go the service dog route first. I inquired again with REACH to see what we needed to do. I checked with Pearl to verify she had her doctor's letter and to let her know that a small army would be marching into her home in few days. She had no other information and no preparation. One week after it all began, the Certified Reach Evaluator, a temperament evaluator, two strangers to the dog and family, two children and one female German Shepherd unknown to both Greta & Pearl, arrived at their home armed only with clipboards and score sheets. It was a cool day but I was sweating. I had no idea how the obedience aspect of the evaluation would go. I did not know how much control Pearl would need or have over Greta in the face of strange dogs inside her home territory, unfamiliar kids bumping into her, food temptations while being called and so on. I was confident that Greta would be fine with everything else. Forty-five minutes later, the score sheets were given to the Reach evaluator; Greta had passed with flying colors!! At the tender age of eleven years, Greta became a Certified Level One Assistance Dog and Pearl became the proudest lady in Arizona. As they were presented with their official certificate and Greta's badge, Pearl held out her arms to the entire room proclaiming, "I love you!" As the "team" was pulling out of the parking lot we saw Pearl with the letter and certificate in hand, and Greta, with her badge hanging from her collar, heading in the direction of the Manager's Office. I phoned her the following evening to ask her how it went. Upon seeing their credentials, the Manager said, "Well, I guess she can go just about anywhere now," to which Pearl replied, "You're damn right she can."